I lie in bed in the dark trying to keep up with my hurtling thoughts. My wife sleeps beside me – sweetly, untroubled – backlit by the alarm clock. Occasional footsteps, growing fewer and fewer as the night goes on, rustle outside the window. The room is dark and still, except for the thoughts running away from me. The tempo of my thoughts is allegro. FINally my music education pays off! Allegro: fast, quickly and bright. 120-168 beats per minute. Lively. And WHY CAN’T I SLEEP?!? The water bill is due…then the hospital bill is due…MORTgage is due…and what was that RATTLING SOUND in the car?!? Midnight comes and I run the numbers in my head. 1:00 AM comes and I plan the payoffs. I write a check in my head for the mortgage and cringe. The heating oil truck pulls up in my mind for another delivery and I panic. I see the price at the pump in my thoughts and freak out. How the hell did people afford to live before? The economy was so much different in the ‘50s, ‘60s, ‘70s…what happened to the middle class?!? WHAT ABOUT US?!? I think and feel the worst and convince myself that it will never get better. And then I think of my life and all at once it hits me and I realize that it IS better. I remember I’m a stable married homeowner with a stable job and a stable life. I realize that we’re handling the expenses of life and we’re not breaking. I think of where I was a decade ago. Back then I was alone and sleeping on a mattress. Back then I couldn’t imagine not having roommates or not being employed through a temp agency. Back then I was bouncing $300 rent checks and I couldn’t even think of eating out at nice places. Tonight we had a hell of a nice dinner and talked of our coming vacation at the beach. And we’re making the mortgage and all the bills. I would NOT have been having this conversation back then. I remember my breathing exercises from therapy, and how much they help. I train myself to slooooooowwwwwwww my breathing – and with it my thoughts – from allegro to adagio. Ah hah! Adagio: slow and stately (literally, “at ease”). 66-76 beats per minute. Sloooowwww, solemn. Definitive. My music education has paid off! At ease. At ease I breeeeaaaaattttthhhhhheeeeeeee. INNNNNhaaaaaaaaling pooositive. Hooooollllllding onnn to pooositive. EXhaling negative. EXhaling negative. PUSHing out negative. PUSHing out negative. NOTHing I can do about it now….so let it goooooooooo…. My breathing slooooooows down my brain and body. Caaallllmmmmm and clarity befall the path of my thoughts. And I realize that I’m alllllright. What can I do about that surprise bill at 2:00 AM? NOTHing. So let it gooooooo. What can I do about that surprise bill at 9:00 AM? Pay it. And then it’s goooooone. My thoughts slooowww to an adagio that I can carry about all day. Confident, controlled. At ease. 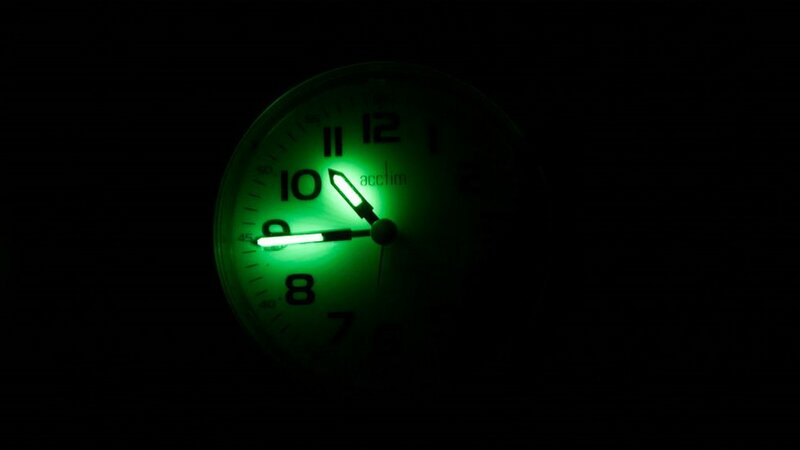 The alarm clock glows 3:00 AM. My wife sleeps on, undisturbed. I exhale. Adagio. I inhale. Adagio. Loved that. Know the feeling, and great with the use of the music terms too. Feels very appropriate for this story. I totally relate. In the world of mental health this is called, “self-soothing.” Why is it soooo hard to turn those thoughts off? If only I could unplug my brain when I go to sleep, I’d drift like a baby. It’s so hard, right? I’ve trained myself to shut it down…mostly. But it’s soooo tough. Great post, Brian. Love the music and the breath references. And yes, I imagine everyone who reads this will relate! And please get out of my head. Seriously, it’s crowded enough as with all the worries. But I’m getting such great material in there! That was wonderful. It still is making me smile. Insomnia…the creative mind’s curse. YES! I am so excited, Brian! The pacing of this piece plays out so well on the page. While the experiences are familiar, the images are all your own. Very, very nice! Damn straight! You rock, sir! What are you doing in my head? I so often have these nights, and I always remember how bad life has been at times and how good it is now. I end up giving myself a mental clip across the ear and tell myself to shut up and go to sleep! Thank you so much! Great having you here! Wonderful and so real. I don’t try to force myself back to sleep with music – I turn on BBC World Service. I’m a long time insomniac in spurts. And you captured the restlessness of it so well! Better that than a speeding oncoming train, right? Aww, thank you so much! I’m actually not participating in peer awards anymore, but I’m sincerely honored that you would think of me. It is appreciated. Great to have you here! I understand. BTW this mornings post was beautiful.